Looking for Keno games that are exactly like the casino? Below are several of the most popular games available for you to play right now. Ultimate X Keno, Super Times Pay Keno, Cleopatra Keno, and 4 Card Cleopatra Keno are GOLD Member exclusives. 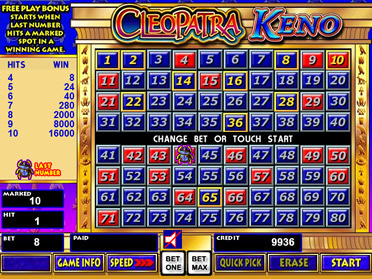 Classic Keno, Caveman Keno Plus, 4 Card Caveman Keno, 4 Card Caveman Keno Plus, Triple Power Keno, Extra Draw Keno, Power Keno, 4 Card Keno, 246 Way Keno, 369 Way Keno, Super Way Keno, Caveman and Multi-Card Keno are available to everyone. Click below to play the game of your choice.